In honor of National Flower Day and the start of Spring, we’re sharing how we made a laser cut wooden planter box. Last year we were approached by a local library to create an activity for their fifth anniversary. We knew the event was outdoors, and that we wanted to create something that would keep not only kids but parents engaged. We wanted the activity to be meaningful for the library, too. After researching that wood is the traditional gift given for a fifth anniversary, we came up with an idea of a small wooden planter box. We created a custom laser cut wooden planter box, but there’s various ways to create your own planter box. We made holes on the bottom piece of wood, and glued the pieces together with wood glue. After drying, we added a few rocks (not too many because we didn’t want to weigh down the bottom wood piece) for drainage, and then topped with soil. We thumbed some seeds into the soil, and sprinkled more dirt on top. We then decorated the outside of our planter boxes with permanent marker, and some acrylic paint. We were inspired by Brit + Co’s post, Modern DIY Planters to Gift Mom on Mother’s Day. This post was created in support of National DIY DAY. National DIY DAY, April 2, 2017 is a movement to celebrate creativity and the art of making. The Craft Box Girls team launched the very first National DIY DAY on April 2, 2016 with the intention to bring people together for a day of making. As a National DIY DAY ambassador Make San Antonio is proud to support AdoptAClassroom.org and their mission to give teachers a hand by providing much-needed classroom materials so that their students can learn and succeed. 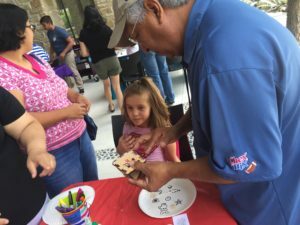 National DIY DAY and Make San Antonio is committed to supporting classrooms and providing tools for students and teachers to enhance the creative learning experience.